In the 18th Century most people considered the Earth to be relatively young, a view essentially based on a number of authoritative pronouncements from the Church. In 1541 Martin Luther (1483-1546) stated that creation occurred in 3,961 BC. Archbishop Ussher (1581-1656), using the Old Testament record, announced a more precise Earth birthdate as 23rd October 4,004 BC, giving an age of around 6,000 years. A number of respected scientists had also used biblical records to calculate similar Earth ages with Johannes Kepler (1571–1630) proposing 3,992 BC and Isaac Newton (1642 -1727) suggesting 4,000 BC. During the 18th Century, James Hutton challenged this orthodoxy. Born in Edinburgh on June 3rd, 1726, Hutton entered the University of Edinburgh in 1740 to study medicine, completing his medical degree at the University of Leyden, Holland in 1749. This is widely regarded as the first serious study of field geology and Steno has rightly been called the Father of Stratigraphy. He proposed that all minerals and rocks originated as fluids, being deposited when particles settled out of fluids to form horizontal layers. This led to Steno’s Principle of Original Horizontality. Steno also proposed that rock layers are deposited in a time sequence. Assuming no subsequent disturbance, the oldest layer was to be found at the bottom and youngest on top. This became known as the Law of Superposition. Additionally, Steno proposed his Principle of Original Lateral Continuity which explained why similar rocks could be found on opposite sides of a valley. Steno suggested that fossils were once living organisms which had been buried by sediments and that all rocks were formed from the Biblical flood within Ussher’s 6,000 years. George-Louis Leclerc, Comte de Buffon (1707-1788) was one naturalist who was convinced that the Earth was much older than Biblical scholars argued. Buffon’s book Histoire Naturelle, published in 1749, described how he envisaged the Earth’s formation from material ejected following a collision between the Sun and a passing comet. Buffon suggested that the Earth had started out as a molten mass which cooled to the point where a large ocean formed. This universal ocean receded, leaving behind landforms we see today. Buffon never actually gave up his belief in a much older Earth. He turned to experiment, timing the cooling rate of spheres made of various materials, scaling the cooling rate up to give estimates of a molten, cooling Earth. In 1778 Buffon revised his book and boldly gave an estimated age of the Earth as 75,000 years although this new estimate still had little impact on thinking of the time which was still entrenched in the ideas of a biblical young Earth and a universal flood. Both ideas were championed by the influential Abraham Werner (1749-1817). Werner was widely acknowledged as the foremost geologist of the 18th century and his thinking about the origin of rocks carried a good deal of weight. Werner was a Neptunist who saw the Earth as once being covered by a deep ocean (Noah’s Flood) with surface rocks, including basalt, being formed by precipitation or sedimentation. He explained different rock characteristics as resulting from their depth, composition and conditions during formation from the universal ocean. He called fossil-free rocks “primitive rocks”, formed when there was no life on Earth. Whereas Abraham Werner and many others believed that all landforms had been formed by a receding Biblical flood, James Hutton saw things very differently. He envisaged processes of weathering, erosion and deposition in a series of long natural cycles without any need for supernatural intervention or catastrophes. He saw familiar forces such as wind, rain, stream-flow, wave-action, volcanism and earthquakes helping to shape the landscape over a much longer period of time than was allowed by biblical scholars. Hutton was a keen observer, fully aware that a number of ancient man-made structures remained largely unchanged in a thousand or more years. For instance, Hadrian’s Wall had been constructed by the Romans 1,500 years previously and had changed relatively little since construction yet Hutton was expected to believe that all landforms, including rock formations, had been produced in the space of a few thousand years. Hutton became relatively wealthy by investing in the Forth and Clyde Canal and manufacturing sal ammoniac (ammonium chloride). This chemical was widely used as a flux in soldering stained-glass windows; for the relief of sore throats and in the baking of pastry. His wealth provided him with life choices so, although qualified to do so, Hutton didn’t practice medicine. Instead he took up residence at his farm near Berwick in Scotland in 1754 and only occasionally visited Edinburgh during the next 13 years. He continued to pursue his interests in geology and mineralogy while on his farm, consolidating his thoughts and writing an essay on the Natural History of the Earth. In this essay he emphasised the importance of the slow processes of weathering, uplift and erosion in sedimentary rock formation and the emergence of new land masses. Hutton returned to Edinburgh in 1767 where he found a city transformed into a vibrant centre for progressive thinking. The Scottish Enlightenment represented a period when intellectuals from various disciplines converged to produce a hot-bed of new ideas. Amongst them were chemist William Cullen (1710-1790); the discoverer of latent heat, specific heat and carbon dioxide, Joseph Black (1728-1799); inventor and mechanical engineer James Watt (1736-1819); philosopher David Hume (1711-1776); sociologist Adam Ferguson (1723-1816); historian William Robertson (1721-1793); printer and publisher William Smellie (1740-1795) who produced the first Encyclopaedia Brittannica; architect Robert Adam (1728-1792); statesman and scientist Benjamin Franklin (1706-1790); grandfather of Charles Darwin, physician and philosopher Erasmus Darwin (1731-1802); scientist and mathematician John Playfair (1748-1819) and Professor John Walker (1731-1803) who taught geology at the University of Edinburgh. Walker was influential and accepted both the biblical age of the Earth and Werner’s Neptunian theory. In this new era of thinking, rational explanations and experimentation were about to challenge religious dogma and it was during the 18th century that belief in a 6,000 year old Earth was robustly challenged. Hutton could not accept the prevailing ideas that all rocks and minerals had been precipitated from a universal ocean and that the Earth was a mere 6,000 years old. Like Nicolaus Copernicus (1473-1543) and Galileo Galilei (1564-1642) before him and (later) Charles Darwin (1809-1882), Hutton fought to free science from the constraints of religious dogma. It seemed obvious to Hutton that most rocks and minerals could not be precipitated from a universal ocean. After all, they would not even dissolve in hot water. He knew that the only way they could ever become liquids was if they were melted at very high temperatures. Hutton had observed in the field how rock exposures indicated that many areas had alternated between being exposed as land and being covered by sea with extensive, periods of slow sedimentation and erosion. Hutton felt there had been too much acceptance of dogma and insufficient field observation of landforms which would better help scientists understand how they formed. He located and recorded information about specific rock formations and these observations further reinforced his thinking about the impact of long and endless cycles of erosion and deposition. In 1787 Hutton described what is now known as the “Hutton Unconformity” found at Inchbonny, Jedburgh, south-east Scotland and a short distance from Jedburgh Abbey. 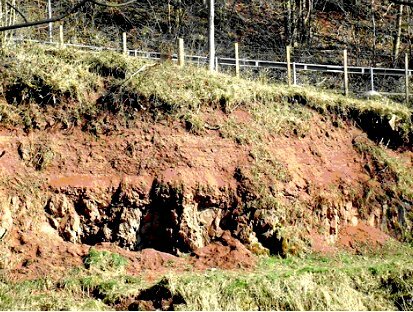 This angular unconformity shows tilted sedimentary rocks overlain by horizontal sedimentary rocks (red sandstone) with the unconformity representing a period of time (hiatus) when there was no deposition. Rather there was folding, uplift and erosion over time before further deposition continued.In the same year (1787) Hutton visited the Isle of Arran, off the south-west coast of Scotland, where he located layered sedimentary rock (Lower Cambrian schist, about 550 million years old) which had been tilted vertically before being eroded and later overlain by younger sedimentary rock (Lower Carboniferous sandstone, about 350 million years old). 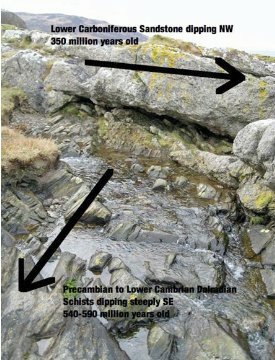 This unconformity also showed that rock formation was not continuous and that the older layer had been tilted, uplifted and eroded before deposition of the younger rock took place. Of course Hutton had no idea of the timescale involved in the formation of this exposure although he was no doubt confident that it required more than 6,000 years. In 1788, Hutton, along with James Hall and John Playfair sailed up the Scottish coast in search of further evidence which would support Hutton’s theories of deposition, uplift and erosion over vast periods of time. Hutton was again looking for an unconformity where an erosional surface separates two rocks of different age. 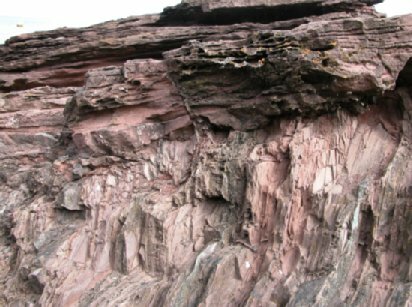 Hutton and his colleagues landed near Siccar Point, Berwickshire, Scotland where they found an ideal unconformity with Silurian greywacke (about 425 million years old) at the base of the cliff, with layers in a vertical position. Hutton called this micaceous schistus. Photo: Dr Cliff Ford (Cliff.Ford@ed.ac.uk). Use permitted if acknowledged. Above the vertical greywacke layers were fragments of greywacke overlain by younger horizontal Old Red Sandstone from the Upper Devonian Period (about 345 million years old). 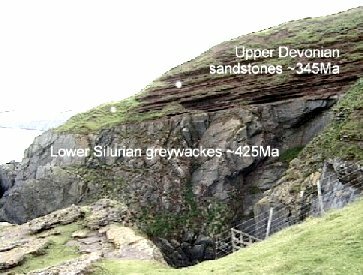 Hutton’s interpretation of the Siccar Point sequence was that the rocks beneath the unconformity were deposited horizontally under water and were clearly older than the rocks above them. The older greywacke was folded, uplifted and eroded and later covered by water. This led to further deposition of sediments and later uplift. Hutton saw the unconformity as representing a period of time (hiatus) where no rock deposits were preserved and later deposition of sandstone on the erosional surface was followed by uplift. He saw pressure and heat as being an integral part of the process. Kirwan attacked Hutton with ferocity, accusing him of being a blasphemer and atheist. However, experimentation was starting to replace dogma in the sciences and Hutton’s views of an ancient Earth and slow natural Earth processes were vindicated, albeit slowly. In 1862 William Thomson (1824-1907) (later known as Lord Kelvin) conducted a more sophisticated variation on Buffon’s work by timing the cooling rate of Earth-like materials. Kelvin arrived at an age of 98 million years which he later revised down to a lower estimate of 20 million years. Although Kelvin’s age of the Earth was dramatically greater than the Biblical age, to geologists, 20 million years was still insufficient for the long cycles of erosion, sedimentation, deposition and uplift which they were increasingly observing in the field. Kelvin was unaware that the Earth’s interior is heated by radioactive decay, consequently his estimate of its age from cooling rates was far too low. It was also in conflict with experimental work on sedimentation rates by John Phillips in 1860 which gave an estimated age of 96 million years; erosional rates by Archibald Geike in 1868 gave an estimated age of 100 million years and ocean salt accumulation rates by John Joly in 1899 gave an estimated age of 80-90 million years. It seemed that towards the end of the 19th Century some agreement had finally been reached about the age of the Earth. This was about to change when Henri Becquerel (1852-1908) and his doctoral student Marie Curie (1867-1934) discovered a number of radioactive sources. The 20th Century saw an end to young Earth arguments and dogma. In 1902 Ernest Rutherford (1871-1937) and Frederick Soddy (1877-1956) demonstrated the exponential nature of radioactive decay with Rutherford suggesting in 1905 that uranium/helium or uranium/lead ratios could be used to calculate the age of the Earth. In 1907, Bertram Boltwood (1870-1927) took a sample of a uranium rich ore and, based on Uranium-Lead dating, calculated an age of 1.64 billion years. Rutherford and Boltwood, calculated several rock ages up to 2.2 billion years. The sudden leap from an Earth that was millions of years old to one aged in billions of years was staggering. Many in the scientific community were initially skeptical about both radiometric dating techniques and the very old Earth ages proposed by Boltwood and later proposed by Arthur Holmes (1890-1965). In 1911 Arthur Holmes used a more accurate uranium decay rate to determine ages for a Carboniferous rock sample (340 million years) and a Precambrian sample (1.64 billion years). In 1927 Holmes published “The Age of the Earth, an Introduction to Geological Ideas” in which he proposed an Earth age estimate of 2 billion years. World War 2 research into radioactivity led to improvements in instrumentation that enabled more precise identification and measurement of isotope abundance. In 1953 Friedrich Houtermans (1903-1966) re-calculated the age of the Earth as 4.5 ± 0.3 billion years which was in close agreement with Claire Patterson’s (1922-1995) estimate in 1956, from meteorite dating. Today’s best estimate for the age of the Earth is 4.55 ± 0.05 billion years with ancient rocks from Greenland, Australia, Canada and Africa returning ages between 2.5 and 3.8 billion years. If a heretic is defined as any person who holds a belief which is in stark contrast to religious dogma or the prevalent view of the time, then James Hutton was an outstanding heretic. His belief that the Earth is much older than the accepted 6,000 years was based firmly on field observations rather than dogma as was his argument that rocks and landforms were not formed by a universal flood. In order to explain the very slow Earth processes he described, Hutton the heretic required much more time. Experimental physics ultimately delivered more than enough of it. Baxter, S. 2003. Revolutions in the Earth – James Hutton and the true age of the world. London, Weidenfeld & Nicholson. Dalrymple, G. B. 1991. The Age of the Earth. California, Stanford University Press. Lovelock, J. 1979. GAIA – A new look at life on Earth. Oxford University Press. Patterson, C.C. 1953. “The isotopic composition of meteoritic, basaltic and oceanic leads, and the age of the Earth" in Proceedings of the Conference on Nuclear Processes in Geologic Settings, Williams Bay, Wisconsin. Repcheck, J. 2004. 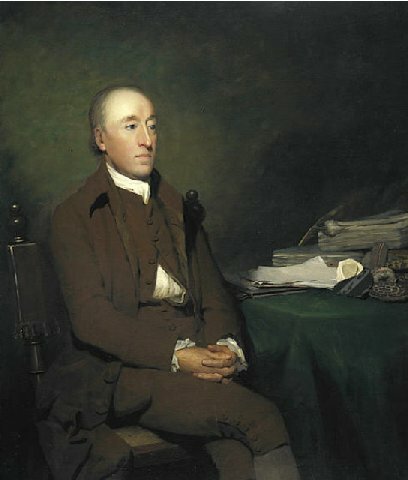 The man who found time – James Hutton and the discovery of the Earth's antiquity. London, Pocket Books. A PDF (364 Kb) of this article can be downloaded here.